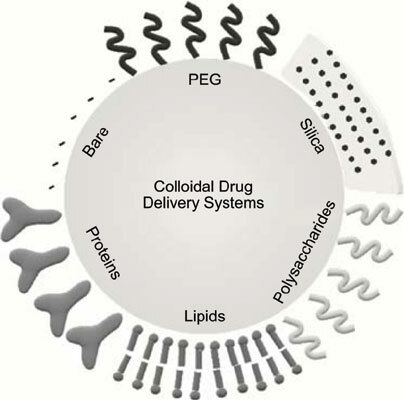 The use of colloidal particles as drug delivery carriers holds a great promise in terms of improvement of traditional treatment and diagnosis of human diseases. Nano- and microsized particles of a different composition including organic and inorganic materials can be fabricated with a great control over size, shape and surface properties. Nevertheless, only some few formulations have surpassed the benchtop and reached the bedside. The principal obstacle of colloidal drug delivery systems is their poor accumulation in target tissues, organs and cells, mainly by efficient sequestration and elimination by the mononuclear phagocytic system. Recent evidence suggests that, besides size, the surface character of colloidal systems is the most determinant design parameter that may ultimately guarantee successful biological performance. To approach these issues, materials designers and engineers can make use of multiple strategies and tools to finely modulate the particles’ surface towards highly efficient and biocompatible materials. In this article, we provide an overview of the most relevant colloidal drug delivery systems, a summary of the available literature regarding the effects of surface charge, hydrophobicity and softness on biological response, and finally, we review the key points of surface modification strategies with organic, inorganic and biological materials. Colloidal drug delivery systems, Nanoparticles, Immune response, Surface modification, Surface charge, Hydrophobicity, PEGylation.